Epson WorkForce 315 Printer for sale, in very good looking & working condition. Not scuffs nor scratches. Please see the pictures. Fully tested and working properly. Print outs included. New black ink cartridge installed and Color Ink Cartridge is about 60% full. Sale includes: Printer, Power Cord & USB Cord. SALE DO NOT INCLUDES: Manual & CD Installation. Remember you can download both for free online. 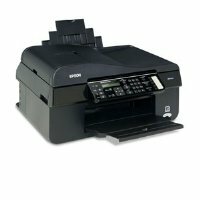 To download the driver , just type on Google:"Epson WorkForce 315 driver download" and then just follow the instructions. Fast Amazon shipping plus a hassle free return policy which means that your satisfaction is guaranteed! Stored, sold and shipped by Amazon. Tracking number provided in your Amazon account with every order. Tested and working properly,see the pictures included.